Chemung County Historical Society: Stough It! 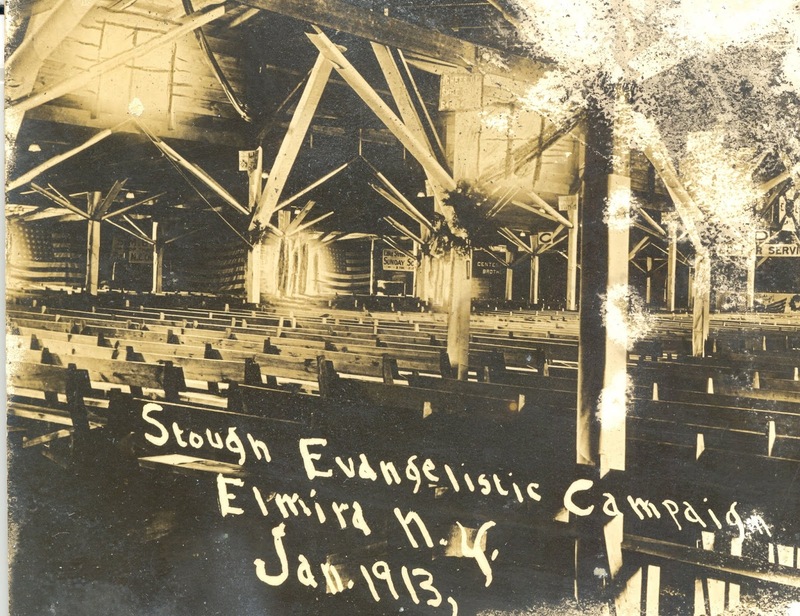 In the early 1910s, the City of Elmira was awash with sin and alcohol. In a city with a population of 37,176 there were 93 saloons, or one for every 400 residents. People could also drink at any one of the 33 hotels or 9 billiard halls with a liquor license and even buy hard liquor for ‘medicinal’ purposes at one of the city’s 27 drug stores. The alcohol trade was highly profitable. One hotel manager estimated in 1913 that he sold $37,620 worth of beer and liquor annually which amounts to approximately $887,315 in today’s dollars. In addition to monies made from alcohol, saloons and billiard halls often made additional revenue from illegal card games or making book on baseball games while hotels cashed in on prostitution. Despite the widespread criminal activity, there were rarely any arrests made. In fact, Briggs Brewery would frequently send a car around to warn saloon owners in advance of a police raid. Stough was having none of it. 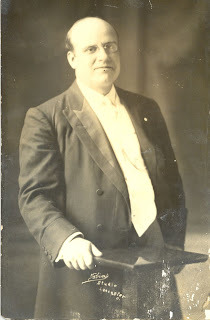 Throughout the month of January, Stough claimed the saloons were violating the statewide ban on Sunday liquor sales; accused the police of rampant corruption and called for the resignation of Police Chief Frank Cassada; called Mayor Daniel Sheehan a lackey of the brewers; and promised to personally root out evidence of criminal behavior. On the night of Saturday, January 25th, he led a parade of followers through the red light district around Railroad Avenue at midnight to make sure saloons were closing for Sunday during. Stough’s antics made him more popular by the day. 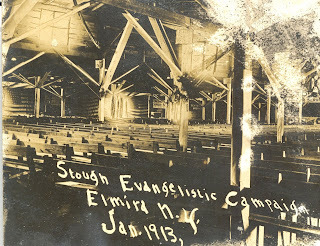 At the start of the month there were only several hundred in attendance but on the 25th there were so many people packed into the tabernacle they had to turn over 2,000 people away. Stough was, in short, a threat to the city’s breweries and their allies in the saloons, police station and mayor’s office. Forced to actually close on Sunday, January 26th, the saloons and the breweries which supplied them lost money. Stough managed to collect and publically preach about evidence of illegal doings by one Railroad Avenue saloonkeeper and the man was forced to flee the city to avoid arrest. During the 1880s, two muckraking preachers had been murdered by saloon owners in Sioux City, Iowa and Jackson, Mississippi for doing exactly the same thing as Stough. The Reverend himself had been threatened and was nearly assaulted during the January 25th parade. His followers were harassed by the police, his lodgings were broken into and a lawsuit for slander was filed by Briggs Brewery, but none of it was enough to make him stop. The city’s alcohol interests did the only thing they could do: frame two of the Stough campaign members for adultery. Yes, adultery. It was literally a crime in those days. On the night of February 10, they arrested Hester Cartwright, a choir singer, in the room of Duncan Spooner, the campaign’s music director, and, by February 19, the case was in court. The city’s brewing interests hoped the case would drag Stough’s name through the mud and drive him from town, but they were sadly mistaken. The following morning over 6,000 supporters showed up at the tabernacle to protest the arrests and raise a legal defense fund. Throughout February, local pastors including those from First Baptist Church, Park Church and the Episcopalian churches threw their support behind Stough. Both the Elmira Star-Gazette and the Elmira Advertiser came out in favor of real reform. The trial was over and the couple acquitted by mid-April, but it didn’t stop the formation of several civic improvement leagues, a police commission investigation into Police Chief Frank Cassada or Mayor Sheehan being voted out of office in November. During the trial, Briggs Brewery manager J. John Hassett said that the frame up was a matter of good business policy but clearly it was anything but. Briggs Brewery’s efforts to silence Dr. Stough in the winter of 1913 ultimately cost them hundreds of dollars in lost revenue, their ally in the mayor’s office and their good name. Public sentiment had turned against them and in April 1916 the city voted itself bone dry, shutting down the saloons and hotels Briggs had fought so hard to keep open. The Trolley Card Game: Look Out For It!